NEW!! 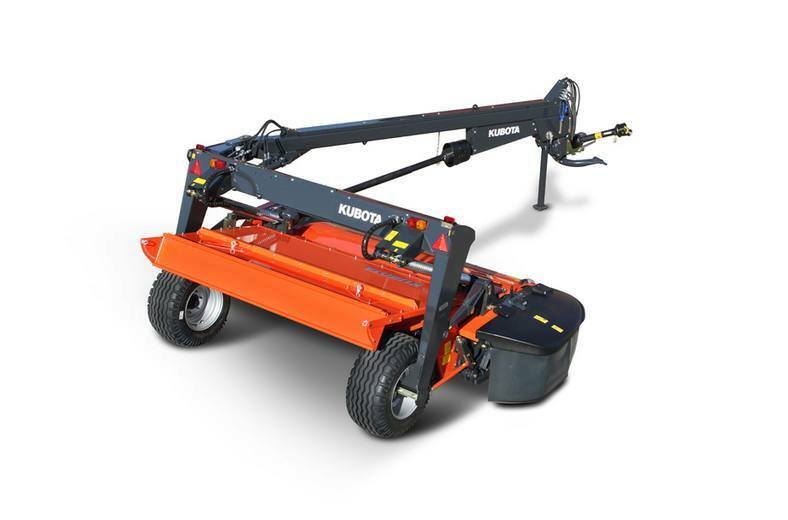 Kubota 10'6" Disc Mower Conditioner. Transport With Integrated Lighting Kit: The DMC8000 series offers a secure and convenient transport solution, which includes an integrated lighting kit for excellent road visibility. The transport width for DMC8028T and DMC8028R is 8'1" and the transport width for DMC8032T and DMC8032R is 9'1". 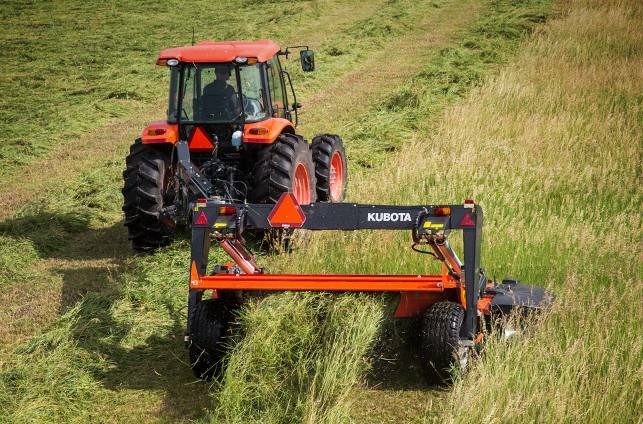 Kubota Suspension for Clean Cutting Action: The complete mowing section, including the conditioner, is suspended independently from the main chassis by either two or four long adjustable suspension springs, allowing it to follow the field contour. If an obstacle is encountered in the field, the mowing section will lift up and backwards, protecting the cutterbar from damage. 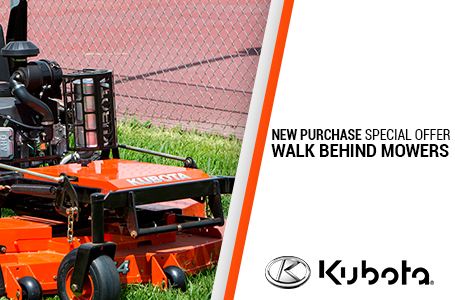 When the obstacle is passed, the mowing section automatically returns to the working position. Express Quick Change of Knives: Mowers can be fitted with the 'Express' system for quick and easy changing of knives. Simply place the lever around the bolt, release the spring by turning the lever and the knife is ready to be replaced with a new one. Wide Spreading Kit: All models can be fitted with an optional easy-to-use wide spreading kit. This enables crop to be cut and spread in one operation, saving both time and resources. Best of all, changing from swathing to wide spreading is a one-man-job. 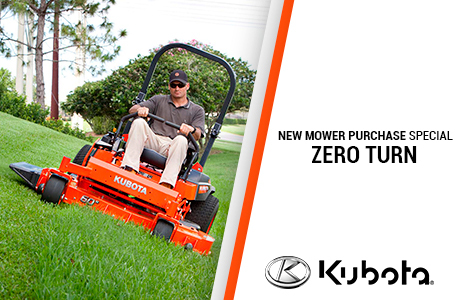 Counter-Rotating Three-Bladed Discs: With three blades per disc, Kubota mowers are constantly cutting. This means a third less load per blade, an even load on the drive and smoother power usage - which produces an even, cleanly cut stubble. Each steel blade is precisely angled to immediately discharge the cut crop upwards by both air flow and mechanical action. Fully Welded Cutterbar: The fully welded Kubota cutterbar with overlapping C-channels makes for a stiff and strong design, ensuring a high level of durability. The cutterbar’s design, with machined gears and large bearings along with low oil requirements, allows for a low working temperature for efficient oil cooling and lubrication of the entire cutterbar. 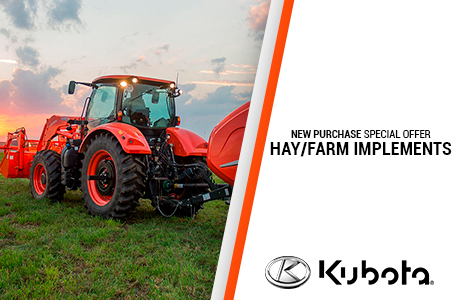 Benefits of Kubota Suspension Springs Design: The long spring design allows for excellent ground following ability. 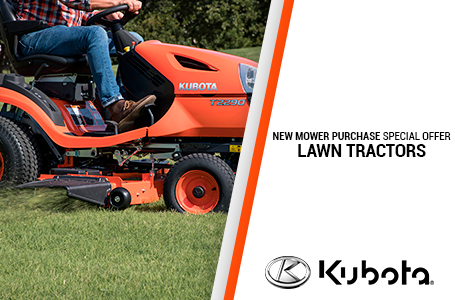 In uneven fields, the mower is able to adapt +19.7"/-5.9" The suspension springs are fitted on the widest possible position of the mowing section to ensure even ground pressure. The weight on ground is stable and only approximately 88 -110 pounds on each side. The suspension arms are fitted between the mowing section and mainframe so when an obstacle is encountered, the mowing section moves backwards and upwards to allow the object to pass. 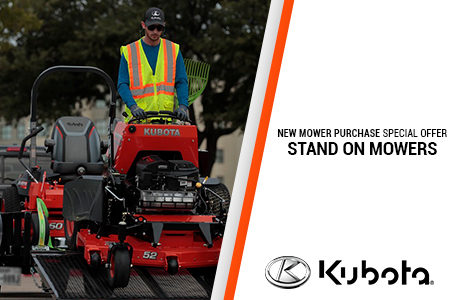 The mower will automatically return to its working position once the obstacle is cleared. Easy Adjustment of Stubble Height: A simple crank adjusts the whole cutterbar assembly up or down to a desired stubble height. Additional skids are available to increase cutting height. Cutting Widths: DMC8028T - 9’2", DMC8032T - 10’6", DMC8032R - 10’6"
Working Width (ft): 10 ft.6 in. Transport Width (ft): 9 ft.8 in. Stubble height (inch): 1.18 in.-1.57 in.